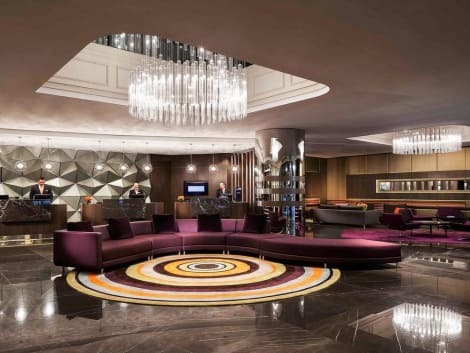 Experience exceptional service and world-class facilities at the Sydney Hilton hotel. Located in the heart of the city, enjoy easy access to all of Sydney’s favorite attractions including the Sydney Opera House, Darling Harbor, and Bondi Beach.Refresh in one of three iconic dining and beverage venues. Celebrity Chef Luke Mangan’s One Hat multi-award winning restaurant glass brasserie serves fresh refined plates to be enjoyed in the elegant setting. Sip a cocktail on the rooftop terrace of the fashionable Zeta Bar or enjoy a cold beer in the Victorian surrounds of Marble Bar.Host weddings, meetings, and events for between 3 and 3,000 guests at the Hilton Sydney hotel and stay connected at the business center featuring an array of office equipment, secretarial services and internet access.Work out at the LivingWell Health Club featuring the latest cardiovascular and strength training equipment, personal trainers, and exercise classes. Swim lengths in the 25-meter indoor pool or wind down in the saunas and steam rooms. Pamper yourself with a treatment in the relaxing setting of the Alysium Spa.Unwind in a modern guest room with innovative amenities such as an Aquavision bathroom TV and pillow menu. Enjoy ultimate recuperation in the Relaxation Suite with different areas for rest, work and lounging. Indulge in the Hilton Master Suite featuring a stand-alone spa bath overlooking the city. Enjoy a complimentary continental breakfast, evening drinks and canapés in the private Executive Lounge when staying in an Executive Room or any type of Suite. With a stay at Pullman Sydney Hyde Park, you'll be centrally located in Sydney, within a 5-minute walk of Hyde Park and Australian Museum. 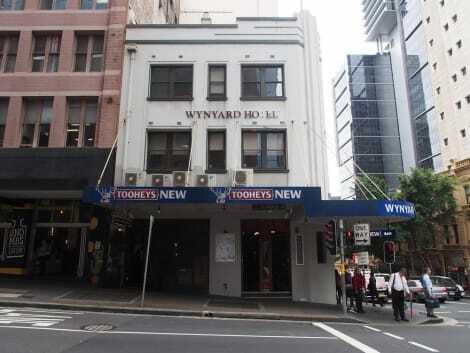 This 5-star hotel is 0.5 mi (0.8 km) from Capitol Theatre and 0.5 mi (0.8 km) from Sydney Town Hall. Make yourself at home in one of the 68 air-conditioned rooms featuring kitchens with refrigerators and ovens. Your bed comes with premium bedding, and all rooms are furnished with sofa beds. Rooms have private balconies. Flat-screen televisions with satellite programming are provided for your entertainment, with wired and wireless Internet access available for a surcharge. Private bathrooms with separate bathtubs and showers feature jetted bathtubs and complimentary toiletries. 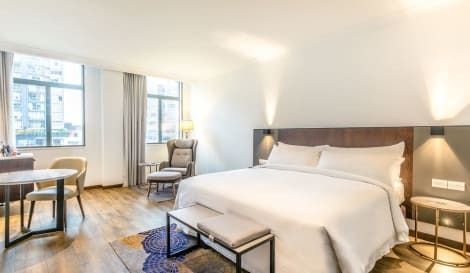 Meriton Suites Waterloo offers refurbished, self-contained accommodation, just 10 minutes’ drive from central Sydney and Sydney International Airport. Guests have access to an off-site indoor pool, a hot tub and a fitness centre located 3 minutes' walk from the hotel. Guests enjoy unlimited free WiFi at the property. This refurbished apartment complex is situated opposite Moore Park Golf Course. Sydney Cricket Ground (SCG), Sydney Football Stadium and Royal Randwick Racecourse are all within a 5-minute drive away. The air-conditioned suites each have laundry facilities and a flat-screen TV with cable channels and a DVD player. Studios offer a kitchenette, while all other suites have a full kitchen. The property is 5 minutes’ walk from a number of trendy cafés and restaurants on Danks Street. A supermarket and a number of fast food options are located within the complex. Additional toiletries, shaving kits, dental packs and extra towels are available from reception. Meriton Suites Zetland offer luxurious self-contained accommodation just 5 minutes’ drive from the lively Danks Street cafés. The air-conditioned suites feature a flat-screen TV with satellite channels. Guests enjoy unlimited, free WiFi at the property. Union Pay is accepted here. Meriton Suites Zetland are 3 minutes’ drive from Moore Park Golf Course, and 15 minutes’ walk from Green Square Train Station. Sydney International Airport and Sydney CBD are both a 15-minute drive away. All suites have a well-equipped kitchenette or kitchen with a microwave and refrigerator. Each suite has a spacious living and dining area. 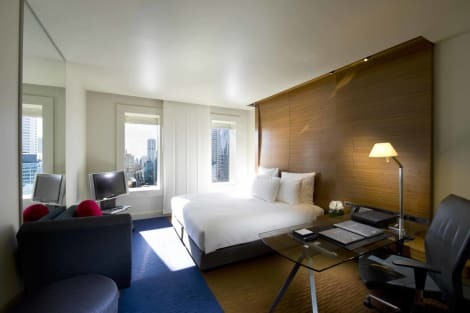 Make yourself at home in one of the 436 air-conditioned rooms featuring iPod docking stations and minibars. LCD televisions with satellite programming are provided for your entertainment, with wired and wireless Internet access available for a surcharge. Private bathrooms with shower/tub combinations feature complimentary toiletries and hair dryers. Conveniences include phones, as well as safes and desks. Located across the road from Bondi Beach, guests enjoy free WiFi at Hotel Bondi. You can enjoy a meal at the onsite bar and restaurant or use the gaming lounge facilities. Some rooms have a balcony with sea views. Bondi Hotel is a 7-minute drive from Bondi Junction and a 15-minute drive from Sydney CBD. Sydney Airport is a 22-minute drive away. All air-conditioned rooms feature a flat-screen TV, a fridge and tea and coffee making facilities. They offer ironing facilities and a bathroom with free toiletries. Some rooms have a kitchenette or a sofa. Guests enjoy the convenience of 24-hour check in, and room service is also available. Boasting a swimming pool and sauna, as well as a fully equipped fitness centre, Meriton Suites Chatswood offers stylish and sophisticated accommodation, just 15 minutes' drive from the heart of Sydney's CBD. Guests enjoy unlimited free WiFi at the property. Completed in 2015, the Meriton Suites Chatswood building is 5 minutes' walk to the vibrant shopping centres of Chatswood Chase and Westfield Chatswood. The transport hubs of Chatswood Train Station and bus complex are also 5 minutes' walk away. The nearest airport is Kingsford Smith Airport, 15 km from the property. Each contemporary air-conditioned apartment offers a well-equipped kitchen complete with a dishwasher, stovetop and microwave. All include a spacious living area with a flat-screen TV and satellite channels. Your private bathroom includes luxury toiletries and a hairdryer. Guests have access to 24-hour front desk and concierge service. Baggage storage facilities are available. Find golden beaches, sensational shopping and winning nightlife in the glamorous city of Sydney on Australia's sunny East coast. Stretch out on sun-drenched beaches or join the professionals in the sensational surf. Head to Bondi beach to relax on golden sands, take a dip in the turquoise water and have a go at catching the perfect wave. If you're planning to include lots of beach time choose hotels near Bondi Beach to bag your spot on the sand early. Beyond the usual beach attractions you'll also find excellent restaurants, scenic coastal walks and thriving nightlife here. Enjoy spectacular ocean views on the Bondi to Coogee clifftop walk. And, as you head towards Tamarama Beach, keep a look out for the 100 sculptures on display as part of the Sculpture by the Sea exhibition between October and November. As the sun goes down and you swap flip-flops for shoes, it's time to join a glamorous crowd in Bondi's chic bars. Sean's Panorama and Icebergs are both popular places to dine and drink while you enjoy stunning sea views. For a more relaxed feel, take the short and scenic 30-minute ferry ride to Manly Beach where you'll find tranquil bays, beautiful beaches and a tree-lined promenade. If surfing seems a bit intimidating, this is a good place to try the tamer, paddle boarding. Sydney has been picked as one of our top destinations for Where's hot in November. So be sure to check out more information on activities in the springtime and the average temperatures. Hang out with a glittering crowd at Sydney harbour bars and gaze at iconic Sydney Opera House and Sydney Bridge. Enjoy the stunning backdrop as you relax at harbourside bars, many with live music or DJs in the summer. See the masterpiece of 20th century architecture that is Sydney Opera House. If you want to admire more than aesthetics, why not go behind-the-scenes on a Sydney Opera House or Backstage Tour? Over 2 hours, you'll discover the drama and secrets of Australia's most celebrated theatres. Make your trip an unforgetSEOSITE_LEVEL_DESCRIPTION one and choose from our great range of luxury Sydney hotels, many with fantastic views across the harbour. Go walkabout in stylish Paddington to shop for new additions to your wardrobe in the chic boutiques on Oxford Street. You'll find exquisite vintage finds, sophisticated international labels and understated luxury here so there's plenty of inspiration. Meanwhile, in Newtown you can rummage through vintage fashion, book, antique and homeware shops. Or visit the grand Queen Victoria Building to explore over 200 shops, boutiques and cafes in magnificent surroundings.